From the account you link to: The noise was terrifying, people were dying outside, the kids were scared out of their minds and they had been told over and over that some man named Nasrallah was responsible for their having to cower underground for days on end. On the day that photo was taken, the girls had emerged from the underground bomb shelters for the first time in five days. A new army unit had just arrived in the town and was preparing to shell the area across the border. The unit attracted the attention of twelve photojournalists – Israeli and foreign. The girls and their families gathered around to check out the big attraction in the small town – foreigners. They were relieved and probably a little giddy at being outside in the fresh air for the first time in days. They were probably happy to talk to people. And they enjoyed the attention of the photographers. Sure. I don’t think I ever implied otherwise. But I’m also just not sure what difference it makes. 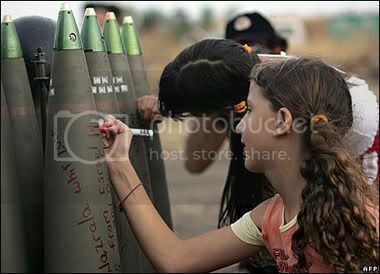 At the end of the day, there these kids were, encouraged to scribble messages on artillery shells, and oblivious to or at least profoundly detached from what the shells actually do. I think it’s an instructive counterpoint to a long series of similar pictures of Palestinian kids If some Arabic bloggers are upset about this picture, they should also look at those — in both cases, it’s not the parents’ or the country’s finest moment. But that’s easy for me to say, sitting safe and sound thousands of miles away. Thanks for the link. No, a cause is no excuse. Of course. But a cause can help to prevent to take one specific situation for a general position. I wrote some of that poorly, but was maybe a little more oversensitive than warranted, too. I mainly wanted to respond to what I’d read. Thanks again for sharing the link, please always feel free to do so. My only comment: it’s not a competition. I would, however, agree with him that Muslims in America today have it generally worse off than Jews, in a variety of ways, including having more immediate reasons to fear. But there’s enough to go round, if one pays attention. Especially given that the causes — say, someone walking into a Jewish gathering place, and killing eight people — often strike people randomly. On the other hand, if you look “like an Arab” and have One Of Them Names, problems will strike more systematically when, say, going through customs, or in many other situations.